It is not uncommon for us to get inquiries such as these, and it is with great frustration and sadness that we often are faced with educating people after the damage has been done. So, please let me take a moment to reach out to our Facebook friends and family and be proactive about this topic. All pesticides are designed to kill. Some are very targeted, such as B. T. (Bacillus thuringiensis) which primarily affects Lepidopterans (moths and butterflies), but most pesticides are broad and indiscriminate. When you make the choice to treat your house or landscape with rodenticides or grub treatment or mosquito foggers or any other pesticide treatment, you have an intent of ridding yourself of a specific creature that you find distasteful. However, nothing in nature exists in a vacuum. Everything is connected. When you affect one population, it has a ripple effect across the populations that depend upon and coexist with it. When you spray insecticide, for instance, it does not just kill the ‘bugs’ you don’t like, but kills all insects, including honeybees, butterflies and ladybugs. Likewise, when you spray, the insects do not simply disappear off the face of the earth. Many live a short time before they perish. 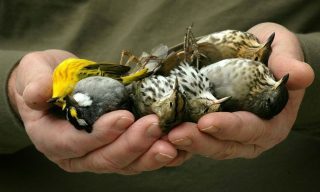 In this time, they may be consumed by natural predators, like songbirds, small mammals and other insects. Pesticides may have a direct toxicity to these animals or may build up in their fat or blood and cause illness or death over time. Even so-called “green” chemicals are still intended to kill, and though they may be derived from natural sources or biodegrade quickly, they are still highly toxic to you and other organisms. Friends, it is so very important in this day and age, with the steady decline of bird populations and the utter devastation of pollinator populations that we humans take a serious, proactive look at the choices we make and the practices we support — either directly or indirectly. It is vital that we not go blindly into the world, but make ourselves informed and educated about products and practices and about science, industry and nature. Here at the Audubon Society of Rhode Island, we very much want to help people become educated and able to make informed choices. We are here to answer your questions and point you in the direction of reliable and scientifically accurate information. But we also encourage you to think and question BEFORE you act. Your actions have consequences. ← HELP SPREAD THE WORD!